For today’s Destination of the Week, TPG contributor Jen Jones Donatelli takes us south of the border to one of Mexico’s most popular beach vacation spots: Cancun. As she notes, however, there’s a lot more to Cancun and the Riviera Maya than just fun in the sun. 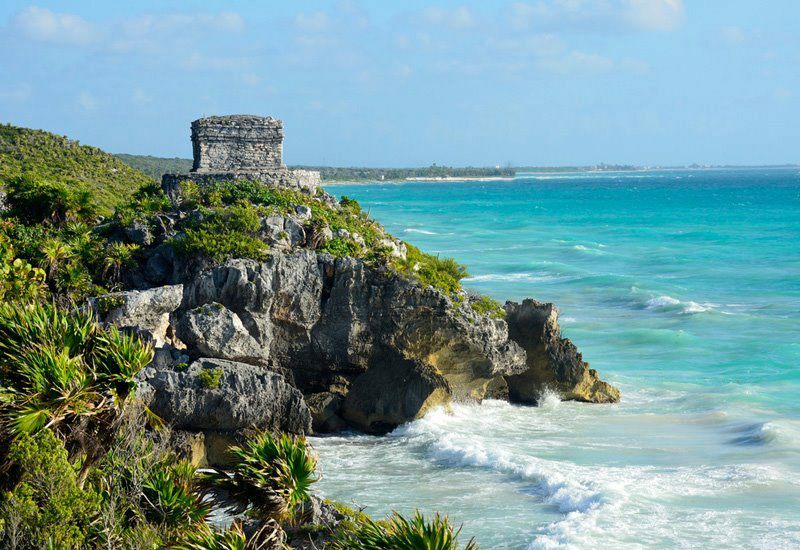 The ruins of the Mayan city of Tulum sit perched above the sea. Oh, Mexico — you just keep me coming back for more. Truth be told, I can’t get enough of the beautiful beaches, laid-back vibe, artsy flair, and adventurous excursions that await in vibrant Mexico. Most recently, I visited Cancun and the Riviera Maya and was entranced by the experience. 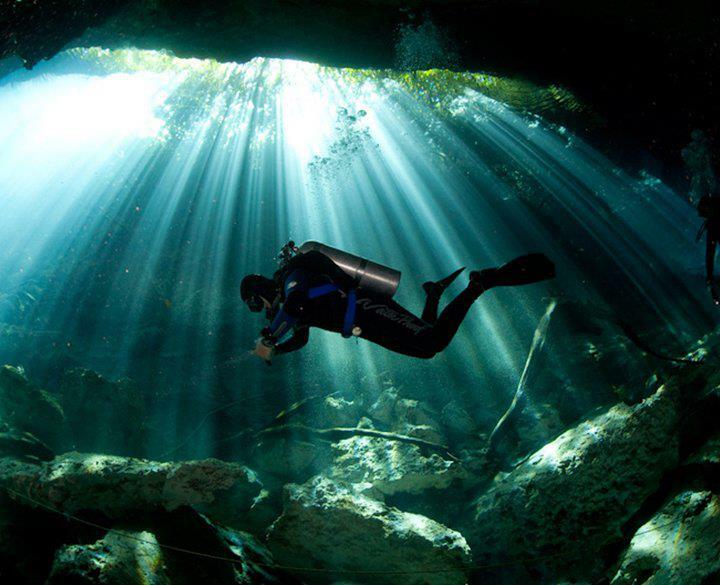 Located on the eastern part of the Yucatan peninsula on the Caribbean Sea, this tropical destination has something for everyone—history buffs will love visiting the Mayan ruins, while outdoorsy types will dig the area’s natural cenotes. Most of the hotels and resorts offer enough activities and amenities to keep you entertained during your entire stay, but special excursions abound for those who want to get out and experience this unique region. Since the Riviera Maya region occupies more than a 90-mile stretch, it’s important to be strategic in your choice of final destination. The decision to visit Cancun or the Riviera Maya boils down to a few key factors: those looking for easy access to lively nightlife, plentiful shopping and a more urban feel might want to hit the sands of Cancun, while the Riviera Maya lends itself to a more outdoorsy, easy-breezy feel and is more spread out in general. 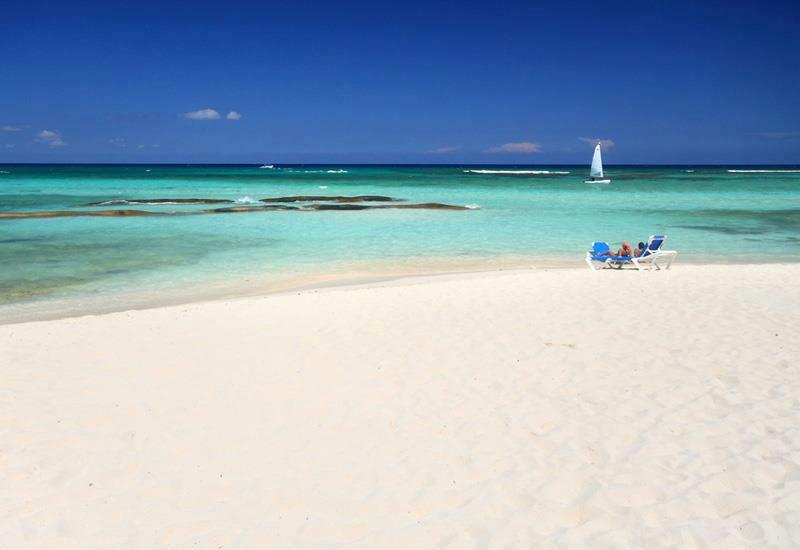 (You’ll also find more all-inclusive options in the Riviera Maya.) Some of the most popular destinations in the Riviera Maya include Playa del Carmen, Tulum (recently vaunted as “Mexico’s most stylish beach destination” in Travel + Leisure) and the island of Cozumel. In my opinion, visiting the Mayan archaeological sites is an absolute must—whether you head inland to well-known Chichen Itza, little-known gem Ek Balam, or beachside Tulum. I recommend Ek Balam, as you can actually climb the temples and see the ruins up close (the others have “look, but don’t touch”-style policies due to high foot traffic). On my visit there, I was actually able to view intact Mayan inscriptions, though I was unable to decipher any apocalyptic meaning. Archaelogical eco-park Xcaret is another popular place to visit—offering diverse options such as a coral reef aquarium, butterfly pavilion, dolphin swimming, caves, beaches, underground pools and natural underground rivers. If you love nature, a trip to the Isla Mujeres Turtle Farm is sure to bring you out of your shell; turtle fans in particular may want to visit in September and October, when guests can participate in baby sea turtle releases at select resorts such as Barcelo Maya Beach Resort. 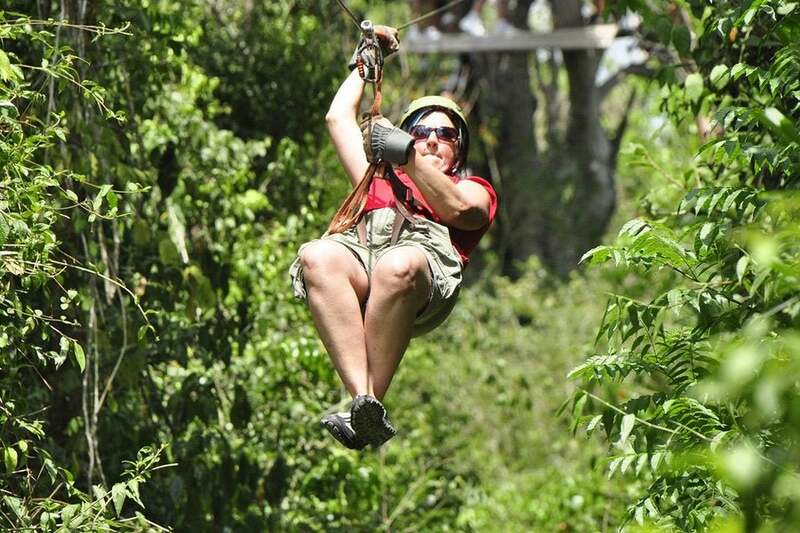 Zipline through the Riviera Maya’s lush jungles with a company like Selvatica. And, of course, no visit to Cancun and/or the Riviera Maya is complete without sun and fun—make sure to indulge in some snorkeling, scuba diving or simply swimming in the gorgeous Caribbean sea during your trip. For that reason, you’ll want to be especially diligent about arranging ground transportation ahead of time, so that you don’t get dinged on last-minute cab fare. Many hotels offer their own airport transfer services; you can also find a list of airport-approved options here. 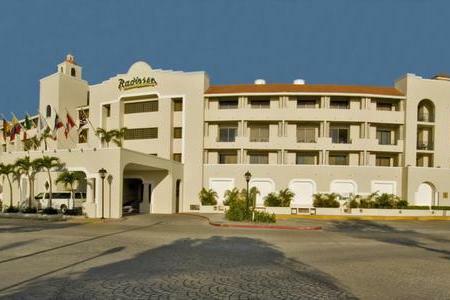 Exterior of the Radisson Hotel Hacienda in Cancun. Radisson Hotel Hacienda,Cancun: If you’d rather stay in the thick of Cancun’s downtown than by the water, the Radisson Hotel Hacienda might be the perfect pick. (And if you do get the urge for some beach time, the hotel offers a free shuttle.) On-site features include a pool, fitness center, business center and El Agave restaurant; the hotel also offers free wi-fi in all rooms. Rates in November start at $62USD/night; Club Carlson members can redeem 9,000 Gold points or 5,000 points + $41.40 for a free night. 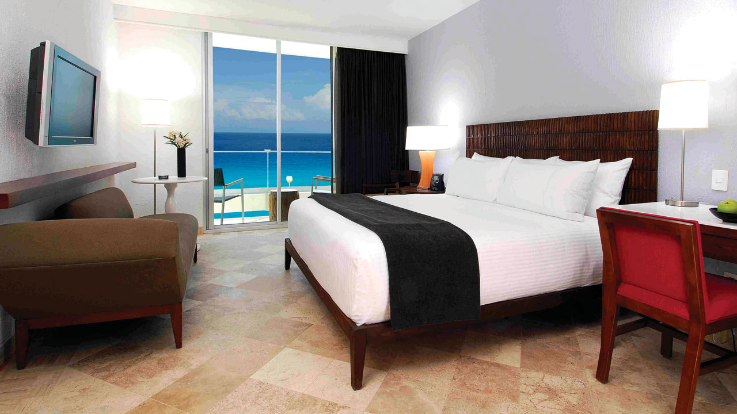 Ocean view king guest room at the Hyatt Regency Cancun. Hyatt Regency Cancun: This beachfront hotel features 295 rooms and suites, all with private balconies. Enjoy the view of the Caribbean sea while working out in the fitness center, relax at the Beach House Spa or wine and dine at one of five bars and restaurants. If you book by January 7th, you can take advantage of their current “Sunshine on Sale” promotion, which provides a fourth night free and 20% off discounts on food and beverage orders and spa treatments. In November, average nightly rates start at $135USD/night, or you can redeem a free night at this Category 2 hotel with 8,000 Gold Passport points. The CasaMagna Marriott Resort & Spa features the Ohtli Spa. CasaMagna Marriott Resort & Spa (Cancun): Named one of Conde Nast Traveler’s “5 Best Hotels in Latin America,” this beachfront hotel is located 10 miles from CUN airport. All rooms feature Revive bedding, 32-inch LCD TVs and private balconies; if you’re feeling extra flush, you can book one of 24 Caribbean suites, 8 Executive suites, 4 Magna Suites or 2 Presidential Suites. In November, rates start at $129USD/night, or you can redeem a free night with 25,000 points (20,000 with PointSavers). The Ritz-Carlton Cancun features a Club Level with private Club Lounge. Ritz-Carlton Cancun: Situated on 1,200 feet of white sand beach in Cancun’s “Hotel Zone,” the luxurious Ritz-Carlton offers 365 rooms and suites—all with sea views. 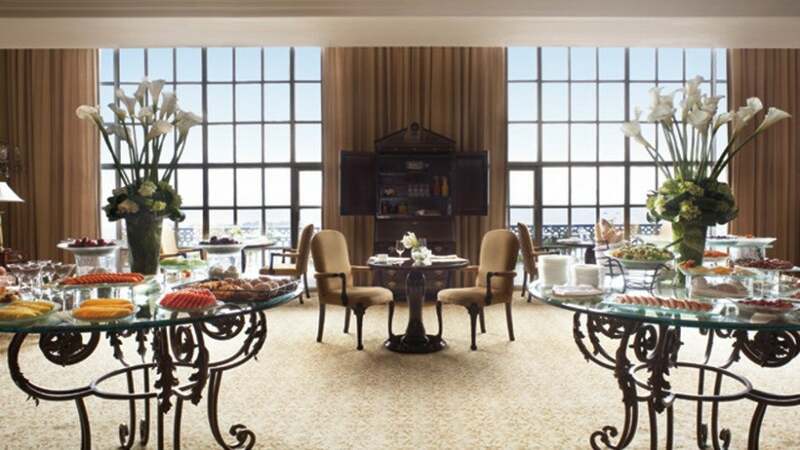 Seven restaurants, two heated outdoor pools, complimentary fitness center, tennis center and the Kayanta Spa make comprise the deluxe Ritz-Carlton experience. Along with a gift shop, there are also Escada and La Perla boutiques on-site. A car rental agency is also on property. Travelers who go before December 22nd get a free fourth night; those staying five nights will get the fifth night free and a $100 resort credit. November rates start at $279 USD night; 40,000 Tier points are required to book a free one-night stay. Other Marriott properties in the Cancun area include Courtyard Cancun and JW Marriott Resort & Spa. Pool area at the Presidente InterContinental Cancun Resort. InterContinental Presidente Cancun Resort (Cancun): Recently renovated in 2010, the 289-room InterContinental Presidente features one of the “best beaches in Cancun” (corroborated by a few TripAdvisor reviews). 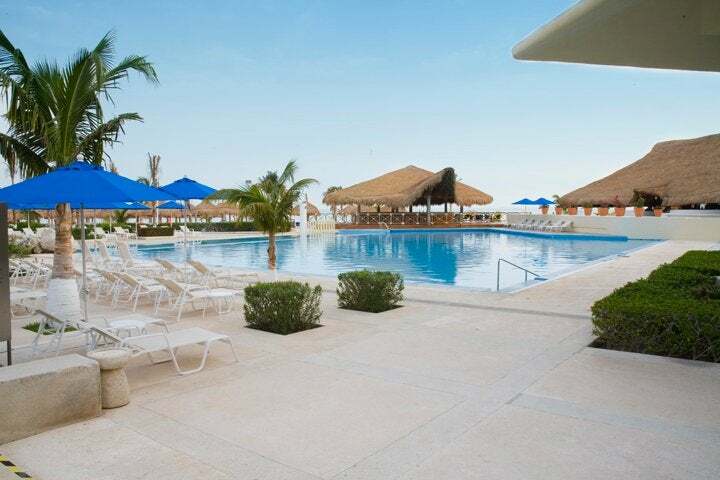 The hotel is affiliated with Club Presidente, a membership club that affords numerous travel benefits. November rates start at $100USD/night. Lobby area at the Holiday Inn Express Playacar. Holiday Inn Express Playacar (Playa del Carmen): Located in colorful Playa del Carmen, this hotel is a short distance from the beach and nearby 5th Avenue (Avenida Quinta) corridor, where you’ll find an array of shopping and nightlife; the hotel offers a free shuttle to anywhere within a 3-mile radius. Complimentary buffet breakfast is offered daily. And don’t miss out on the chance to visit popular adventure park Xcaret, just 5 km away. November rates start at $68USD/night, or get a free night with 15,000 Priority Club points, 10,000+$40 or 5,000 + $70. Other Priority Club properties in Cancun include the Holiday Inn Express – Cancun Zona Hotelera and the all-inclusive Holiday Inn – Cancun Arenas. 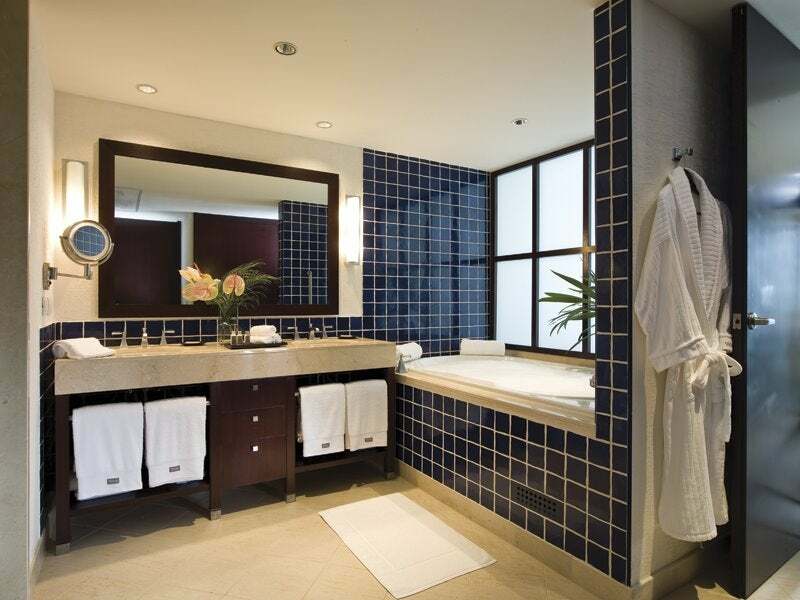 Heavenly Bath at the Westin Lagunamar Ocean Resort. 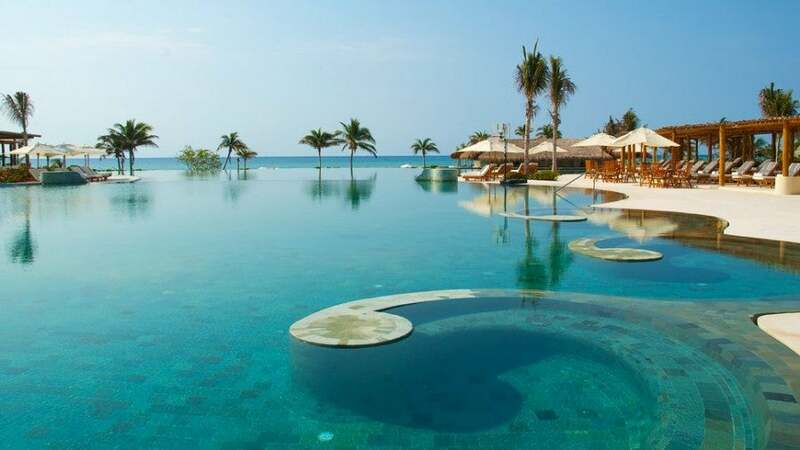 Westin Lagunamar Ocean Resort Villas & Spa (Cancun): A selection on Expedia’s Insider Select List, the beachfront Westin Lagunamar provides plenty of opportunity to soak and siesta—including three beach-facing pools. It’s a great time to visit this property, as its new Heavenly Spa by Westin is opening in December. The resort also hosts many activities, from Mexican cooking lessons to salsa dance to poolside movies. And if you’re itchy to see some Mayan ruins on your vacation, no need to go far: the 1,500-year-old Templo del Alacran edifice is located on resort grounds. November rates start at $139USD/night, or spend 10,000 Starpoints to stay at this Category 4 hotel. Other Starwood properties on the Riviera Maya are the Category 3 Westin Resort & Spa (recipient of a AAA Three-Diamond Award) in Cancun and the in-progress W Kanai Retreat (set to open in 2014). No matter which property you stay at, be sure to take advantage of Starwood’s “Better by the Night” promotion, through which you can earn double Starpoints on eligible stays of 1-2 nights and triple Starpoints on stays of 3+ nights. You can also get 250 points simply for booking at SPG.com or through a Starwood website, or 500 points for booking through SPG’s iPhone app. Maroma Mayan Riviera by Orient-Express. Maroma Mayan Riviera by Orient-Express (Playa del Carmen): This dreamy Maroma Beach-based resort is the only Fine Hotels & Resorts affiliate in Riviera Maya. Along with all the usual FHR benefits, you’ll receive a 50-minute complimentary massage at Kinan Spa for up to two people per room as a perk for booking. Afterwards, keep the blissful buzz with a wine tasting at El Sol restaurant, which boasts a wine cellar that was given Wine Spectator’s “Award for Excellence” three years in a row, or tequila tasting at Freddy’s Tequila and Ceviche Bar, which stocks more than 120 tequilas and mezcals. In November, rooms start at $525USD/night. When cardholders use a Visa Signature credit card to book a room through the Visa Signature Hotels program, they are eligible to receive extra perks such as discounted room rates, room upgrades, free breakfast, early check-in and late check-out, dining and spa credits and more. Visa Signature cards include the Chase Sapphire Preferred, Chase Sapphire, British Airways Visa Signature Card, the Hyatt card, the Marriott Rewards Premier Credit Card and Marriott Rewards cards, the Southwest Rapid Rewards Plus card, Bank of America’s Alaska Airlines Visa Signature credit card and Hawaiian Airlines cards, Capital One Venture Rewards Credit Card, US Bank FlexPerks, and many more, so chances are you’re carrying at least one of them in your wallet. Lobby area at the Fairmont Mayakoba. Fairmont Mayakoba (Playa del Carmen): About 40 minutes south of CUN Airport near Playa del Carmen, this property is set in a lush gated, car-free community rife with dunes, tropical forest, mangroves and limestone canals. Stay in a rooftop Bambu suite with its own infinity pool, or hit the links on the Greg-Norman designed El Camaleon golf course. For being a Visa Signature guest, you’ll receive free in-room Internet or valet parking, as well as complimentary continental breakfast, VIP guest status and a $25 food or beverage voucher. Late checkout and room upgrades are also provided when available. Rates start at $219USD/night. Pool area at the Grand Velas Riviera Maya. Grand Velas Riviera Maya (Playa del Carmen): More than 500 suites are spread out across this spacious property’s three distinct wings. Set on 1,000 feet of white sand beach, Grand Velas is the only AAA Five Diamond all-inclusive property in the Mexican Caribbean. 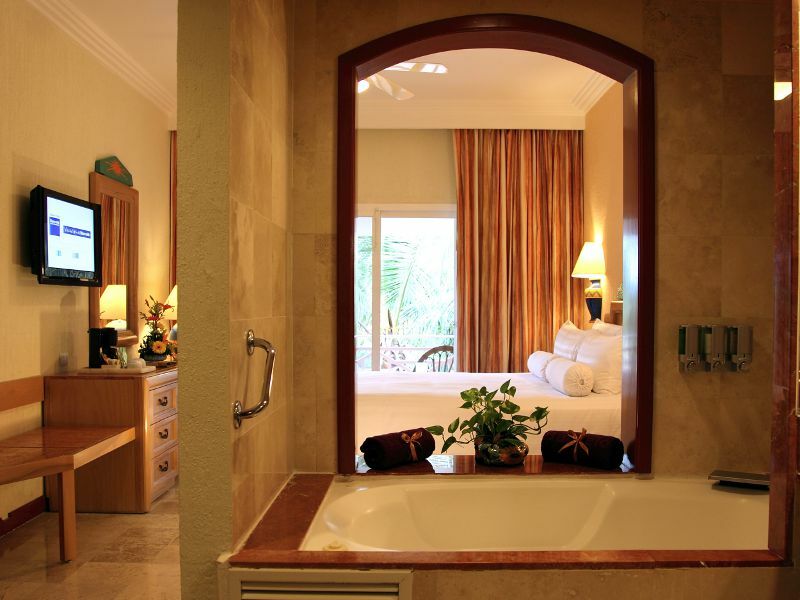 It is about five minutes from downtown Playa del Carmen and 35 minutes from CUN Airport. Foodies take heed: the property offers eight gourmet restaurants and is the only in the region to offer a custom culinary tour. Grand Velas will also host the upcoming Cancun-Riviera Maya Wine & Food Festival in March 2013. This property features all of the same Visa Signature perks as the Fairmont Mayakoba, and rates start at $608USD/night. Other Visa Signature properties in Playa del Carmen are the Banyan Tree Mayakoba and the Viceroy Riviera Maya; around the region you’ll also find Zoetry Paraiso de la Bonita (in Puerto Morelos), Esencia (in Xpu-ha), and Maroma Resort (as mentioned above). King guest room at the Barcelo Maya Beach Resort. 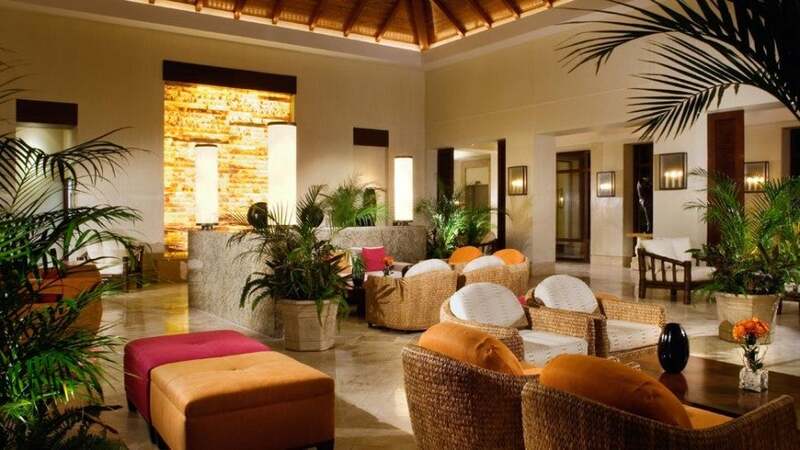 Barcelo Maya Beach Resort (Xpu-ha): Set in peaceful Xpu-ha between Tulum and Playa del Carmen, Barcelo Maya Beach Resort is a sprawling property that provides an affordable all-inclusive option (especially for families and groups) in a beautiful setting. Along with 14 bars and 21 restaurants, an on-site theater and disco provide plenty of nighttime fun. For those who’d like to upgrade their stay, the Club Premium program provides access to a club lounge outfitted with computers, snacks and beverages (non-alcoholic and alcoholic—can you say champagne and Bloody Mary bar? 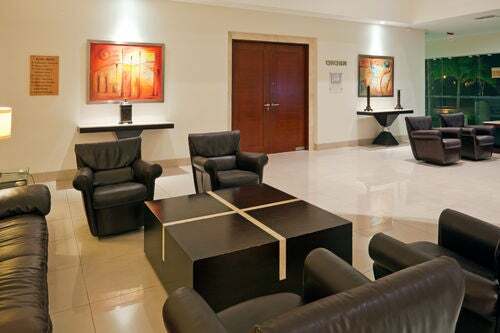 ), along with perks like private check-in, free wi-fi and free room service. November rates start at $185USD/night or $243USD/night for Club Premium; thanks to a special partnership, Choice Hotels points can be redeemed for stays at Barcelo hotels.